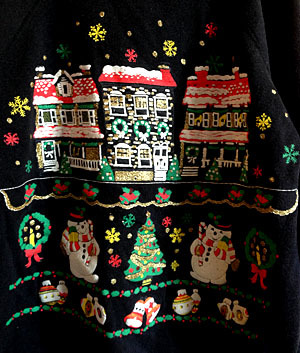 (mens M) Ugly Xmas Sweatshirt, Black with Snowmen, Cozy Houses, Bells! 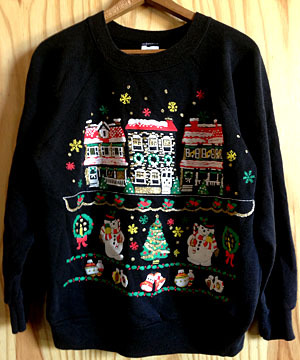 Home > Ugly Christmas Sweaters > Ugly Christmas Sweatshirts > (mens M) Ugly Xmas Sweatshirt, Black with Snowmen, Cozy Houses, Bells! Mens Vintage Ugly Xmas Sweatshirt. Black base with 'rows' of PUFFY-PAINT Graphics like multicolored snowflakes, Cozy Snow-covered houses with Wreaths and Glittery gold accents, Bells, Decked out Xmas Trees, Candles and Two Smiling Snowmen in top-hats with scarves and big Candy-canes. So much Xmas-y goodness!! Back is Solid. Tag reads "Pannill Original Sweatshirt Co." Cotton Acrylic Blend. Made in USA. Condition: Very Good.Looks a little faded from washing. Does not detract from the awesomeness of this sweater!